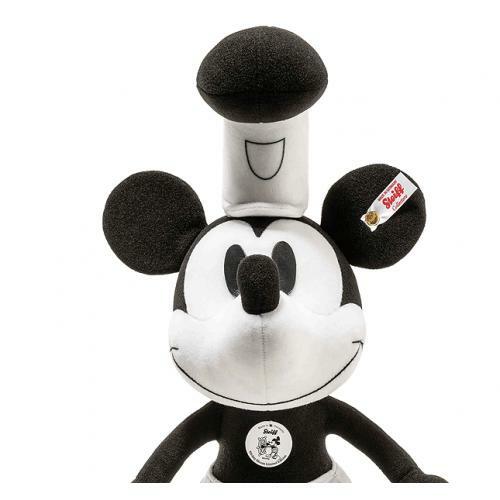 Disney Steamboat Willie - Mickey Mouse by Steiff is hand made of finest Trevira Velvet in black and white and wears the famous Steiff trademark, Button in Ear along with the white limited edition ear tag. Mickey Mouse made his debut on November 18, 1928, at the Colony Theater in New York in Steamboat Willie, Disney’s first animated cartoon with synchronized sound. Walt Disney directed the short film and contributed his own squeaks to the soundtrack, which was backed by a 15-piece band recorded with the Powers Cinephone process. As a mischievous deckhand on a riverboat, Mickey – to Minnie’s delight – creates a musical version of “Turkey in the Straw,” utilizing an animal menagerie as his instruments. The tyrannical Captain Pete is not amused, and Mickey finds himself peeling potatoes in the galley. 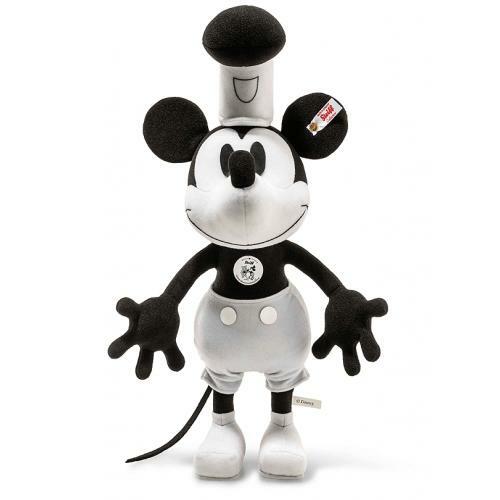 In celebration of 90 years of Mickey Mouse, we are pleased to present a Steamboat Willie - Mickey Mouse by Steiff. He is offered as a limited edition of only 1,090 pieces, is made of finest Trevira velvet, wears a chest tag, which shows him navigating the ship and stands 35 cm tall. His legendary pants with white buttons and matching hat make him a real eye-catcher. 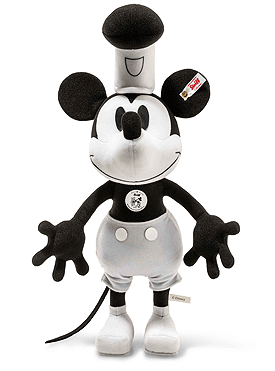 In keeping with the black and white production of Mickey Mouse’s film debut, he has been designed in black and white.